Welcome to Open Road – the new rental service for accessible cars, MPV’s and minibuses from Allied Vehicles – the UK’s leading provider of wheelchair accessible cars to the UK Motability Scheme. Most of us take getting out and about for granted. For others, particularly wheelchair users, this is often only possible if the right transport is readily available. You may be a wheelchair user yourself and keen to get away somewhere for a break. Perhaps you have a relative or friend you would love to take for a day out. Or you may be responsible for clients in a care centre who would benefit from the opportunity to get out and about more for social and practical reasons. As an Open Road customer you’ll have access to a team of experts dedicated to ensuring your experience is as enjoyable and hassle-free as possible. 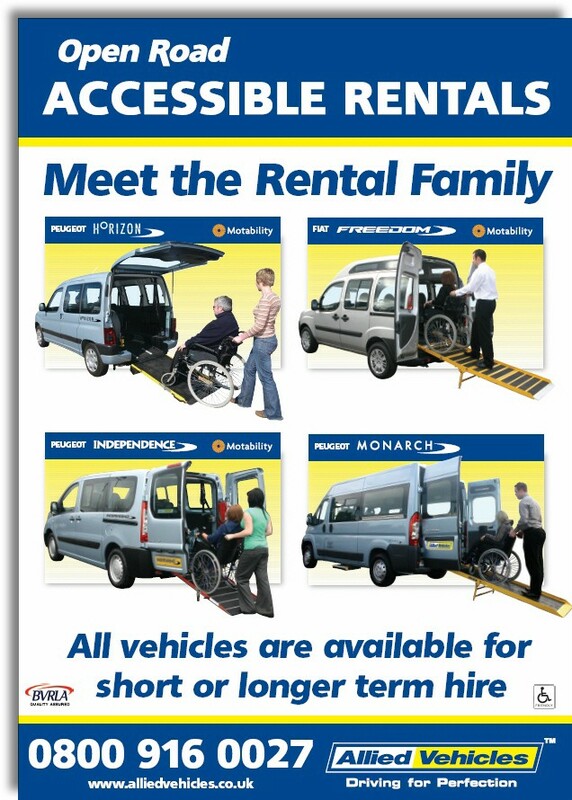 We can deliver your wheelchair accessible vehicle direct to your door, anywhere in the UK. Alternatively you may choose to collect it from one of our regional service centres (Glasgow, Edinburgh or Coventry). We offer competitive rates for every hire, be it for a day or several months. Also ask about our attractive discounts for extended rental periods and for regular customers. Fully comprehensive insurance is available or you can opt to use your own.